Spanish dockworkers' unions have called off a series of one day strikes after a government decree transforming the system of port employment was voted down in Congress today. Plans put forward by the minority Partido Popular government looked set to end job security over a three year period with port employers talking about a 60% cut in average pay. The proposals followed a 2014 European Court of Justice ruling that the existing system fails to comply with EU law. The main dockworkers' union, the Coordinadora Estatal de Trabajadores del Mar, argues that, as in some other EU countries, there are ways to comply with the ruling while safeguarding jobs and avoiding casualisation. 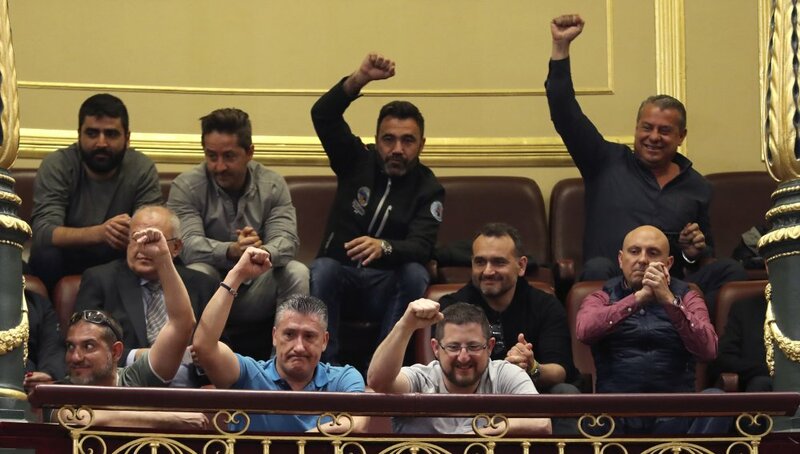 Last minute assurances on job security by minister Iñigo de la Serna failed to convince unions and opposition parties, with deputies in Congress rejecting the decree by 175 votes to 142 with 33 abstentions. All but one of the abstentions came from the liberal right Ciudadanos who last night appeared to be wavering over whether to support the government. This is the first time since 1979 that a decree has has been voted down in Congress. Following the vote in Congress unions have called off the strikes and are planning to resume negotiations with employers and the government on Monday. Thanks for all your work in keeping us all updated, Mark. Yes, the dispute isn't over but it's impressive to have got this far without anyone actually having to take a day off work. Admins: maybe this photo could be added to the report. I've also made a couple of minor edits that need approval. Mark, I've approved the edits and added the pic (who know Saddam Hussein had been reincarnated as a Spanish dock worker?). I believe that as someone who has blog privileges you should be able to approve your own edits in the future. Just make the edits and click on that revisions tab and then revert to the most recent revision. Fantastic news, and yes thanks very much Mark for the updates! This two part radio programme from Spanish state broadcaster rtve is one of the best English language reports on the dispute that I've come across. It also covers the IDC (International Dockworkers Council) and its origins in the 1995-98 Liverpool dockers dispute. Recommended listening. Everyone should listen to this.